During last week's Middle School Community Life, imam and lecturer Fayaz Nawabi shared his unique background and offered students a broader perspective on Islam in America. Though Nawabi has already worked in a variety of industries, including video gaming and sports radio, he is currently pursuing a degree in Public Administration and City Planning. 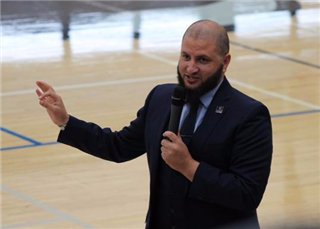 He is also a Hafiz (one who has memorized the Quran) and serves as the Public Relations and Outreach Representative for the Council on American Islamic Relations San Diego Office. During Nawabi's presentation he dispelled some media-perpetuated myths about Islam and encouraged students to ask questions and learn more for themselves.